VPTi10-28 Series EMI/Transient Filter | VPT, Inc. The VPTi10-28 Series EMI filter and transient suppression module combines two modules in one mini package. Reduce the reflected noise of DC-DC converters while simultaneously protecting your power system from inrush current damage. 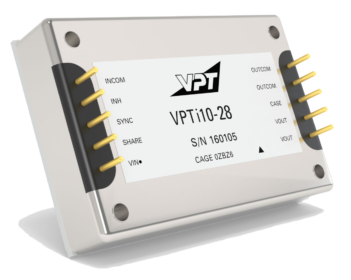 Designed to save valuable space and weight in a power system, the VPTi10-28 is suited for distributed power systems in avionics and military applications.